SpiderFab robotic spiders may build giant orbital structures above all our heads. 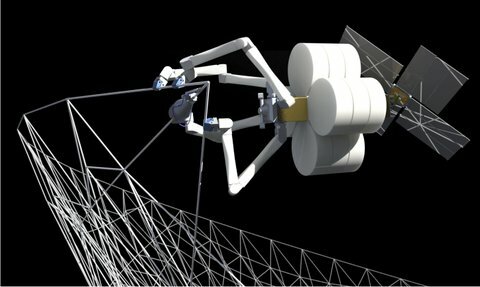 SpiderFab could help build big radio antennas, spacecraft booms and solar arrays in the next decade or so, said Rob Hoyt, CEO and chief scientist of Tethers Unlimited. But he has an even grander vision for the technology (and associated projects the company is working on) over the long haul. Our really long-term objective for all of this work is to eventually enable the use of in-situ resources to construct the infrastructurein space needed to support humanity's expansion throughout the solar system," Hoyt said March 4 during a presentation with NASA's Future In-Space Operations (FISO) working group. Science fiction writers imagined space spiders and their uses a quarter-century ago. In 1978, Arthur C. Clarke wrote about a spider used to test the cables of a space elevator in The Fountains of Paradise. Spinnerettes were used to handle and dispense continuous pseudo one-dimensional diamond crystal in building the cables. Via Space.com; thanks to Fred Kiesche for pointing out this story.